Truthfully, I don't get all that many invites compared to other bloggers. But instead of doing something as pathetic as gatecrashing an event (including sneaking in by pretending to need to use the bathroom), I choose to instead just be thankful for the establishments that do recognize the efforts that Rina and I exert to come up with a fun, yet informative food blog in the form of www.thepickiesteater.net. I choose to focus on cherishing my relationship with these people, instead of thinking ill of those who don't know about my blog, or those that feel it is not what they are looking for when it comes to web publicity. I don't need any awards to validate my accomplishments as a blogger. I have you guys. I have each and everyone of you that at one point in time, I've made laugh, hungry, and perhaps even cry in the four years of The Pickiest Eater's existence. No award.. no trophy is greater than that. Don't blog just to get into events, and to get loot bags or perks. Blog because you want to share with the world something that you enjoy doing.. Whether your passion is in food, fashion, fitness, beauty or travel, it matters not. The choice is yours. Find it. Write from the heart, and everything else will flow naturally. You must not allow yourself to be fooled by blogger groups that promise to get you into events, with "Tokens" and loot bags. Do not allow yourself to be used, in exchange for "Exposure" and "freebies". Tell yourself that you're worth more than that. You'll be surprised how this group will instead find ways to exploit you to benefit their own sites.. All done in the guise of "helping you and your blog grow". I promise you, just blog sincerely and from the heart, and those things will come. PR people and establishments will take notice. It happened to me. It will happen to you. Don't let anyone take away from you that incredible feeling you'll get when a restaurant or agency emails you from out of nowhere for the very first time and tells you, "I came across your blog on the net and enjoyed it.. I would like to invite you to..." . Believe me, it is one of the most amazing feelings in the world. The hard work that you thought no one was paying attention to, was actually appreciated by a complete stranger from the other side of town. There is no need to rush it, because it will eventually happen. And besides, wouldn't it be more fulfilling to know you got invited to an event or restaurant on the strength of your own blog, and not because someone pulled some strings to get you in? I hope PR Agencies, Marketing reps, and restaurant owners will be more vigilant against bloggers with this sort of Gate crashing Modus Operandi. Do not allow yourself to be bullied. Remember this.. They need you more than you need them. Also, letting one through may empower another in the future. Don't be so worried about said bloggers creating negative publicity. The public will see through their true intentions. I think i'm the last person who should be giving advice because this whole blogging thing is still a learning process for me as well, but I just really wanted to give my two cents. Perhaps in your eyes, my opinion is wrong, but let me just say.. This is how I went about blogging career and building my site to what it is today. I played by the rules, never stepped on anyone's toes, and instead built solid foundations of friendship and respect with people within the system, using laughter as my primary tool, instead of fear. I'll be the first to admit that I've got a long way to go to where I want to be, but I think I've done pretty well for myself, don't you think? No one could have said it better than you did! Thanks for this Richie! I'd share this to my blogger friends who share the same sentiments as you do. Thank you so much! I'll take you up on your offer the next time I'm in Cebu! Haha Sam Smith was right on the money! I can't agree with you more sir Richie! I honestly, do not see the logic of barging in to events uninvited. Even asking for some "loot bags" out of no where is quite disturbing. Decency and outright manners should dictate that doing so is a blatant disregard for norms in society. RESPECT is the way to go. The first time I got invited to an invent, made my tummy squeeze in delight as with every invite I get. For the love of writing and experiencing new things, I guess should be the main driving point in writing posts. I just hope these instances do not affect the blogging scene. Hahaha OOTD showdown tayo bro! 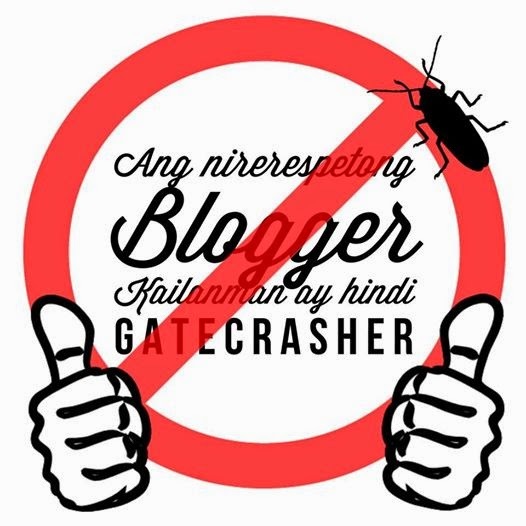 I didn't know there are gatecrasher bloggers until this post. I think to resort to that kind of thing is low and desperate. I used to want to be noticed by PR people, now, not anymore. I write what I want whenever I want. It's more fun to blog this way. Damn! Someone beat me to it! I was ready with my waiter costume so no one would notice me. Back to the drawing board! Hahahaha! haha you get points for creativity though! Very well said,Sir Richie! It's always better to do things truthfully than half-heartedly. It might be nice to have an incentive every now and then but what matters most is that we bloggers do what we love and express our ideas freely rather than to impress people and/or potential sponsors. Thumbs up! Well said, Richiest. I salute bloggers who live in the world of 'meritocracy'. You're one of them. It's really more meaningful to be recognized based on your merits than by frogmarching your way to anything. The latter is very much short-lived. A person who has a very shady character will always, always weed himself out eventually. Awards are good, but the problem with awards is that they are based on criteria that's already established. If a person's aiming for the top seed, he should start a new standard. And of course, there's the issue of whether it's legit or not. That's all. So happy you made this post and that I got the chance to finally meet you the other day. Thank you for sharing. Spot on! haha after 10 years! I'm still busog from everything we ate!! We all appreciate you for publicly stating your stand on this, Richie. You know what they say - all that evil needs to thrive is for good men to do nothing. Miss you loads too, Jus! I really hope to see you again soon!